AIMS AMP Capital Industrial REIT's 2Q19 DPU of 2.5 Scts (flat q-o-q) - inline. Occupancy lifted from 91.5% (1Q) to 93.6% (2Q). Upside potential from redevelopment opportunities (such as 3 Tuas Ave 2, which is ongoing) and unlocking of unutilised GFA. 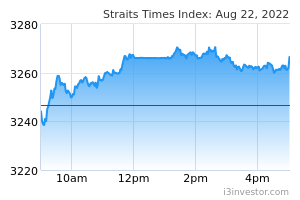 Maintain BUY; Target Price of S$1.55. We see AIMS AMP Capital Industrial REIT as unique for its 600,000 sqft of untapped gross floor area (GFA) - one of the highest among peers. Given the prime location of selected properties, we believe that the Manager can potentially redevelop these sites into future-proof assets such as data centres and estimate that the unlocking of unutilised GFA could lift its proforma FY18 revenue and NAV by 15.8% and 7.9% respectively. Including untapped GFA, AA REIT’s implied yield (NPI/EV) of 6.4% would place it at the upper end of its peer range of 5.1- 6.6%. Maintain BUY and DCF-based Target Price of S$1.55, based on WACC of 6.6% and terminal growth rate of 1.4%. The redevelopment of AIMS AMP Capital Industrial REIT’s under-utilised sites could raise its fair value to S$1.65. The sequential growth in gross combination of the first full quarter of rental contribution from 51 Marsiling 27 Penjuru Lane arising occupancies. Meanwhile, NPI relatively stable at S$19.3m. AIMS AMP Capital Industrial REIT’s share of results from Australia-based Optus due to timing of recoverable expenses recovered from the tenant. Distribution income was flat down 1.6% compared to a year ago. 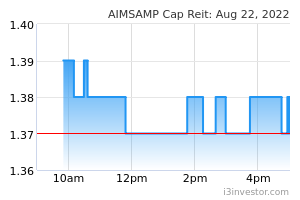 AIMS AMP Capital Industrial REIT also maintained a 2.5-Sct DPU for 2Q19 – unchanged decline vs 2.55 Scts in 2Q18. 1H19 DPU of 5.0 Sct formed 49% of our line. Typically exhibits an increasing DPU trend through quarters, we believe that there could be distributions in subsequent quarters if sustained. AIMS AMP Capital Industrial REIT continued to post improvements on the occupancy front – raised portfolio occupancy from 91.5% (2Q) to 93.6% (3Q), above the industrial average of 88.7%. Executed 14 new and renewal leases in 2Q19, representing over 290,000 sqft (or 4.3% of portfolio NLA). Meanwhile, the uptick in occupancy levels should continue to feature positively in AIMS AMP Capital Industrial REIT’s top-line performance in the upcoming quarters. NAV remained stable at S$1.37 per unit as valuations for its Singapore portfolio, which firmed up slightly, were offset by unfavourable forex effects on its Australia investments. Gearing (A/L) was unchanged at 33.6%, with all-in debt cost of 3.6%. This includes AUD funding for Optus Centre. This implies gearing headroom of > S$150m. As the industrial sector continues to bottom growth over the near-to-medium term will likely be driven by selective unlocking of over 500 sqft of untapped GFA. Redevelopment of Tuas is ongoing and on track for completion in 2Q19. Acquisition opportunities, if they materialise, could also help drive growth. We also note the expiry of the Eurochem master lease experience some slack in efforts to re-commit progress as planned.